Help kids learn vegetables' name in a fun way with "Vegetable Song". Moreover, they will start eating the vegetables such as beans, pumpkin and more that makes them strong and fit as they learn the health benefits of every vegetable. 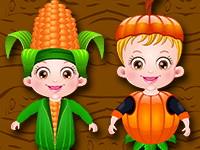 Learning â€“ Children will learn the names of various vegetables in an entertaining way. Have fun watching the song and learn the lyrics! Green and long, green and long. Round and white, round and white. We make soup taste right. Orange and long, orange and long. Help us sing the song. Green or red, green or red. Tall and straight, tall and straight. Don’t we just taste great!